Tuesday evening Belmont Station offered a special treat: the first public tasting of a beer from Portland's newest brewery, Upright Brewing. Upright, located just north of the Rose Garden on the tiny piece of Broadway that lies in the 5th Quadrant, is one of the growing number of Oregon breweries that are avoiding the restaurant business, choosing instead to distribute kegs and do a little bottling. 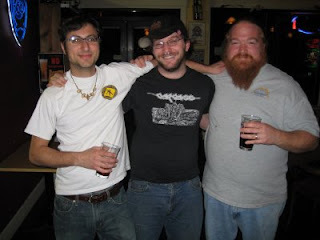 The owner-brewer, Alex Ganum, is on the left in this picture, next to ex-Lompoc brewer Lem and Pub Night stalwart Charles. The Upright brew served up Tuesday night on Belmont's cask engine was Studebacher Hoch Strong Ale, a dark, malty confection with some extra hops in the firkin. Put it in the "dangerous" category -- its smooth roastiness completely disguised its 8% strength. Alex intends to focus on more session-style beers at Upright -- 4% to 5% -- so he was dubious about debuting with the strong ale, not wanting to give people the wrong idea. The Studebacher was brewed to be aged in barrels until winter, but after his barrels were full he had exactly one keg's worth left. A friend had an extra firkin lying around, and convinced Alex to fill it and sell it to Belmont Station. It was meant to be. The first thing you notice about the Studebacher is its maltiness. I think the beer it reminded me the most of is Eel River's Triple Exultation, but with less alcohol and hops. I fancied that there was a yeasty flavor there also, not a flowery Abbey yeast, but a little fresh-dough vapor. That might just be my imagination, suggested by Alex's open-fermentation methods -- something no one else in Portland is doing. At any rate, it was quite tasty; I'll be interested to try the barrel-aged version in a few months. Alex said the first Upright beer we'll see around town will probably be a wheat beer made with a saison yeast. Talking about his goal of high-flavor, low-alcohol beers, he said he enjoys tweaking the noses of Portland beer geeks by saying that the beer he would most like to emulate is Widmer Hefeweizen. It's no joke: Alex says one of the best bets in town is to sit down at the Gasthaus and have a fresh, unfiltered Hef -- tasty, balanced, and not too strong -- poured right at its birthplace. He has a point. The supermarket bottles of Hef are quite dull, but fresh on tap -- with, say, your favorite Lebanese dinner -- it's another animal entirely. It will be a big win for Portland if Upright comes up with similarly food-friendly, drinkable beers like that. The Belmont Station Biercafe has really been whipping it lately with interesting beers from smaller Oregon breweries. Even though it's just part of their priestly mission, I have to award them community service points for offering us this early preview of Upright. For further reading, Angelo has a nice backgrounder on Alex with a short interview.